Too many education brands assume people will listen to them because they’re educators. Everyday learning is being democratized — which means you’ll have to define, build, and defend your brand authority. Here’s how. Schools, colleges, and universities once had a monopoly on education. No one designed it that way — it’s just the way it’s been since the beginning of our modern higher education system. But now in the Information Age, knowledge is becoming commoditized. Learning is being democratized as e-learning courses and platforms continue to spring up. Change is always scary (which is why you should have a plan to defend your brand when any kind of change happens). But if you know how to leverage your institution’s innate brand authority, you have nothing to fear. Brand authority is the second on our list of the marketing conditions you need for successful education marketing. And like all of the marketing conditions we’re discussing in this series, you only have a certain amount of control over it. ”…in conceptualizing a definition of brand authority, it’s useful to think of it as a company’s perceived expertise within an industry or topic. If the public accepts a company as a legitimate expert in their field, then we can say the company has brand authority. I like how the author here emphasizes the concept that brand authority is something you cannot “confer on yourself.” It’s a reputation and a trust that the public has given to you. It’s like the old saying that a leader without followers is only going for a walk. He has no real authority. In the same way, brands that keep talking with no one listening are as ineffective (and annoying) as a toddler with a megaphone. They have no brand authority. So my quick definition of brand authority is this: You’ve got something relevant to say — and people are listening for you to say it. The two components of brand authority — something relevant to say and people who are listening — are simple to understand, but take strategy, hard work, and time to build. Any topic that satisfies those two components are your content sweet spot. Here are some steps you can take to begin building your brand authority right now. 1. Identify your greatest advantage as a school. In an earlier post, I wrote about your greatest competitive advantage as a private school, college, or university. But you have unique qualities about your programs, campus, and mission that position you perfectly to attract an especially distinct type of student to your school. This kind of student is looking for a school just like yours. And your marketing has to trumpet all the qualities that you excel in so that this student can find you easily among your competitors. To be effective, you must build your brand authority around your school’s USP (Unique Selling Proposition). If your marketing messages and campaigns center your brand’s authority on the fact that you’re accredited… so is everyone else! Or, at least, that’s what everyone else is saying in their marketing messaging. So you have to build your authority on the one to three things (I wouldn’t go much more than that.) that make you truly unique. What do you do better than anyone else in your region? What do you have that sets you apart? 2. Clarify your brand elements. Clarify these elements of your brand by creating language that conveys the beauty or distinctiveness of each of these qualities. Any content you create later to demonstrate your brand authority should be used to bring attention to one of these five brand elements. 3. Determine the questions people are asking of you. The questions people are asking you are what will give you the fuel you need to keep pumping out great content, or craft the right marketing campaigns, that will attract and convert leads for your enrollment or development departments. In this step, you will ensure that you have something relevant to say so that people will listen to you. If you answer the questions people naturally expect you to answer, more people will find your content as they type their questions into search engines. 4. Begin creating and publishing content in your sweet spot. Your sweet spot is the place where what makes you unique and where people are asking you to meet them. Now that you know where that spot is, you need to exploit it by creating marketing content in that area. Start a blog, vlog (video blog), or other consistent content channel to publish the content pieces that will demonstrate your expertise in that area as a school. Then, get comfortable. It may take some time for your content to reach your audience and bring them in. Don’t give up too soon! Marketing is a long game. 5. Demonstrate your authority in other spaces. To get your content noticed, you will need to show up in places where your audience hangs out and demonstrate your brand authority. Find content syndication sites where you can post guest blog posts. For example, you could publish a guide to helping your child choose a college for a parenting blog. You can host industry events for the public. If you have a vibrant art program, for example, why not host art exhibits or children’s art camps or programs? Into politics? Then try to host a panel discussion on a currently trending topic. A spin on hosting an event is to sponsor an event. There’s much less work involved for you, but your name is still getting out there. You can also attach your name to a cause by sponsoring or partnering with nonprofit causes in your area that match what your school stands for. Brand authority is a mixture of being unique… being relevant… being noticed. You know a brand has authority when it’s marketing and news are being listened to. 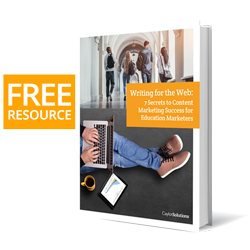 That’s the core challenge of every education marketer — and it’s a challenge you don’t have to face alone. We’d be happy to talk with you for free to see how we can serve your marketing goals. That’s the biggest question when talking about brand authority. How are you getting your audience to listen to what you have to say? In what areas does your school have authority? Let us know in the comments below!